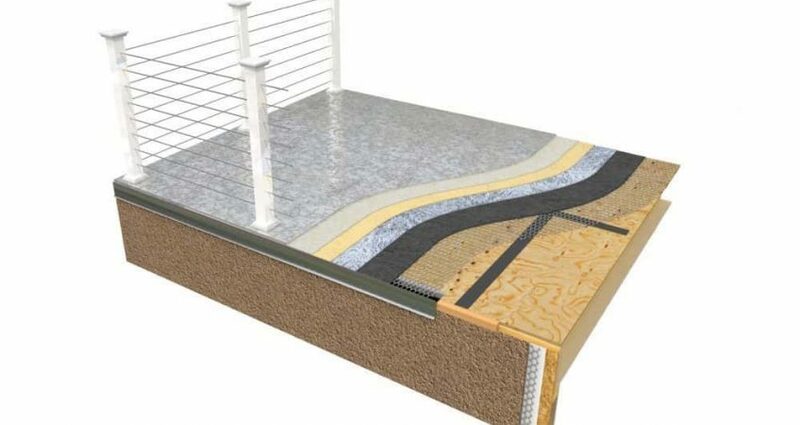 Deck waterproofing that is rolled or troweled over the plywood. Polyurethane systems are directly applied over the plywood with a roller. Polyurethane can prevent water penetration and provide a hard surface for low or moderate levels of pedestrian traffic. The difficulties with this type of system is that multiple layers are required to build up a thick enough layer to completely seal the wood. Unless this is done there remains small holes in the layer that will allow moisture to enter the wood. Furthermore, routine resurfacing is required, every few years, to reseal the surface. A simple polyurethane coating is not a good deck waterproofing system to use with high pedestrian traffic. Cement resin waterproof deck systems are available in a number of different variations. The most common are mixtures of an acrylic polymer with cement. This is applied over the plywood surface and provides a waterproof durable surface. This type of system can be improved by the addition of multiple layers. A base layer of formulated resins to increase the flexibility and the ability to adhere of the surface is then coated with the acrylic polymer and cement layer and finally with an elastomeric polyurethane or polyurea waterproof layer. These systems provide more durability to pedestrian traffic however require routine resealing. To expand on waterproofing that uses lath. Systems that use lath are systems which employ the use of a 2.5 pounds per square yard galvanized metal mesh, which is termed the lath. The lath is attached to the existing surface per manufacturer specifications to provide a stable and adherable surface, to which the coating is to be applied. A polyacrylic emulsion base coat is then applied to provide a tough, durable, even surface that is resistant to cracking. The finish coat is then applied which is available in a wide variety of options. Colors, textures and design patterns of the finished floor, are customized for each individual application. The finished product is durable, cost-effective and requires little maintenance. The lathe system provides superior durability and waterproofing capability compared to the non-lath systems. Problems resulting from the failure of a non-lath system can be remedied by upgrading to a system that uses lath, like the Pli-Dek System. In comparison to a competitor lath system, it is obvious that it is superior. The Pli-Dek system overlaps the edges of the lath by 2 inches, whereas the competitor simply abuts the lath edges. The overlapping is crucial to prevent future cracking of the waterproof surface. This is because a continuous lath surface can only be created by overlapping the conjoining edges. Also, the Pli-Dek waterproof deck system ensures that all water drains are properly installed, and that all flashing is properly attached to the plywood before application of the first layer. These are crucial to prevent water from entering the sub-layers and rotting the deck. In addition, The PLI-DEK™ waterproof deck system for plywood substrates has been evaluated by the International Code Council (ICC-ES) and the American Society of the International Association for Testing and Materials (ATSM) since 1980. The Pli-Dek system is Class “A” fire rated, ADA approved and UV resistant. Pli-Dek Inc. has a wide variety of specialty coatings for the building industry; waterproof deck coatings, fluid applied waterproofing membranes, epoxy flooring and concrete coatings.